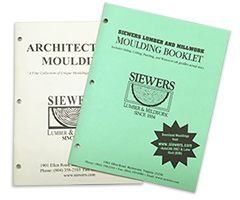 Welcome to the on-line Siewers Moulding Catalog which includes moulding, siding, ceiling, paneling and wainscot. Siewers stocks more than 200 different profiles and manufactures over 100 different profiles in our mill in Richmond. Most mouldings are available in lengths from 4 feet to 16 feet. The mouldings are either in-stock* or by special order. Please note the mouldings that need to be milled (non-stock) have “Non-Stock” indicated by the mounding. If you require a moulding or profile which is not in this catalog, we can manufacture it on our shaper or moulder within a few weeks, in one of over 20 species of wood. Siewers has the capability to produce any mouldings to your sample or pattern. Arched trim is available upon request. To use the catalog, click on any of the types of mouldings listed to the right to view a chart showing that type of moulding The chart includes the size of the moulding, the species of wood in which it is stocked, a picture of the moulding , and a link to download a V13 compatible CAD file. The profiles shown are actual sizes, except where noted. To download a CAD file, click on the link to the right of the picture of the moulding you wish to download. Your browser will prompt you with a message asking if you would like to save the file or download additional information. Choose to “Save File” and a copy of the file will be put on your desktop.